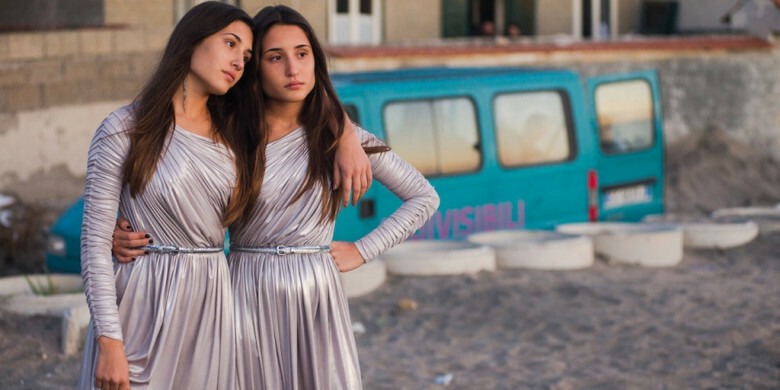 Darkly comic and enchanting, Indivisible (or, “Indivisibli”, in Italian) is the story of beautiful Siamese twin sisters, Dasy and Viola. Joined at the hip, they are exploited by their money-hungry parents who use their disability and angelic singing voices as a novelty crowd-pleaser, raking in money by shamelessly touring them around their Italian city of Naples to perform at local events. Two sides of the same coin, the girl’s shared capillaries lead to shared sensations – such as one feeling sick when the other eats too many pastries. However, they have decidedly different personalities as well as different ambitions as they turn 18 years old. Janis Joplin-obsessed Dasy, dreams of travelling to Los Angeles, like her idol, and of having friends and of one day making love. Viola, on the other hand, doesn’t like the thought of change and is worried that, if emancipated, Dasy would leave her alone with their parents. One day they meet a doctor who lambastes their parents, pointing out that the girls don’t share any organs and therefore could have been separated years ago. The possibilities excite Dasy and scare Viola. However, together, they set out to defy their parents and to finally take control of their own lives, encountering some harsh life lessons on the way. The twins are played with wonderful nuance by real life sisters, Angela and Marianna Fontana, supported brilliantly by distinct, on-point performances from Massimiliano Rossi as the shameless, gambling-addicted father, Peppe; Antonia Truppo as the constantly weed-smoking mother, Titti; and Peppe Servillo as the sleazy local priest. The beautiful Naples coastline and a marvellous colour palette, juxtaposed with a heavy industrial presence and some stark wasteland, provide a surreal backdrop to the film. Heighted in some scenes to take you to an almost dream-like state, this is a very sweet, sisterly-love story, which examines what it means to be independent. Written by Nicola Guaglianone, Barbara Petronio and Edoardo De Angelis and directed by Edoardo De Angelis, the wonderfully-measured performances by the sisters will make you both laugh and cry. Indivisible is a refreshingly different dark comedy. And if your heart-strings aren’t pulled by the end, you really need to get yourself checked out at the doctor. This entry was posted in Film, London Life, Review and tagged Angela Fontana, Antonia Truppo, Barbara Petronio, BFI; London Film Festival; Indivisible; LFF, comedy, dark, Edoardo De Angelis, film, Italy, London, Marianna Fontana, Massimiliano Rossi, Naples, Nicola Guaglianone, Peppe Servillo, preview. Bookmark the permalink.